The Spectrem Affluent Household Outlook, a monthly measure of Affluent investor confidence in four financial factors that impact their daily lives surged in February to an eight-year high. 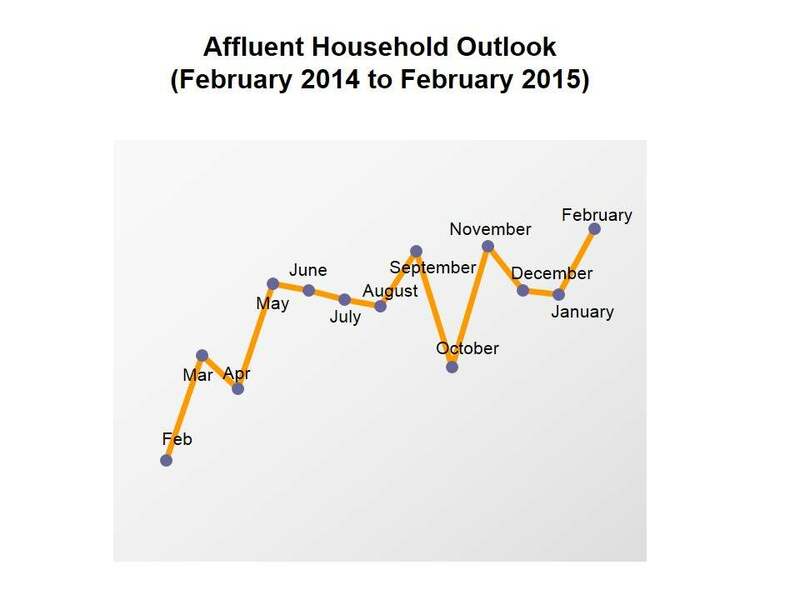 The Spectrem Affluent Household Outlook rose 6.6 points to 32.20, the highest reading since February 2007. It had dipped 0.4 of a point in January following a drop of more than four points in December. Year-over-year, the Outlook, is up 23.22 points. The rise in the Outlook is a reflection of encouraging economic news in February. The government reported earlier in the month that the economy created 257,000 jobs in January. Unemployment rose from 5.6 in December to 5.7 percent, an indication that people who had dropped out of the labor market had resumed looking for work. Household Income, one of the components of the Affluent Household Outlook, rose 10 points in February to 30.80, the highest reading since October 2007. The Economy gained 8.8 points to 24, a three-month high, while Company Health increased 5.6 points to 16.40, a five-month high. Household Assets ticked upward 2 points to 57.60, a seven-month high. Spectrem Group further breaks down Outlook measurement by Millionaire and non-Millionaire households. The Non-Millionaire Household Outlook gained 5.96 points to 30.96, a nine-year high. While there were slight dips in Household Assets and Company Health (2.44 points and 1.09 points, respectively), the Economy jumped 14.15 points to 30.28, the highest reading since January 2011. Household Income gained 13.23 points to 29.36, a five-month high. Year-over-year, the Spectrem non-Millionaire Household Outlook is up 31.34 points. The Spectrem Millionaire Household Outlook gained 6.97 points in February to 33.16, a three-month high. This represents a 15.27 points increase over February 2014. The most significant gain in the Millionaire Household Outlook was in Company Health, which catapulted 11.05 points to 20.57, a seven-month high. Gains in the other Outlook components were more modest. Household Income gained 6.51 points to 31.91, a nine-month high. Household Assets gained 5.93 points to 60.99 and the Economy gained 4.86 points to 19.15, both three-month highs. Non-Millionaires appear to be more confident in the Economy compared with last year than Millionaires. The Economy is up 36.55 points over February 2014, while for Millionaires, it was down 2.26 points.